My husband, Tom, is a third generation rodeo performer. We work weekends doing a Model-T bucking car act. In 1980, we worked the Carthage, Missouri rodeo, a good rodeo in a friendly town. We soon found out just how friendly. After our Saturday night performance, we stayed in Carthage so we could attend church services on Sunday. That night, our dog, Butch, barked all night. Mistakenly, we ignored him, while someone released the roping steers, the cows for the wild cow milking, and our darling Clementine. Clementine is the mule Tom rides in parades and opening rodeo activities. She was chained to the fence near our trailer. Hoping she hadn’t wandered far, we dressed for church, and looked for signs of her on the way. We could see where she’d been, by hoof marks in the dirt and scrapes on the pavement made by the chain she drug behind. After services we resumed our search, but no Clementine. The kids were sad and we were worried. We called the local radio station for help. They made an announcement, and we went to the rodeo arena so folks could contact us. Soon, a pick-up truck pulled up, and two men got out. 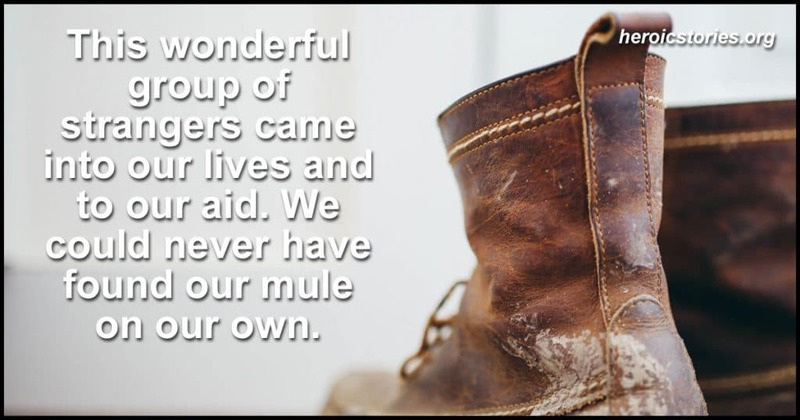 They were members of a local mule rider’s club and wanted to help. We followed them to one member’s home. Soon, there were pick-ups and mules everywhere. Whole families had come to help, with the women bringing food. It had turned into a Sunday Social. The men saddled their mules, including one for Tom, and loaded them into pickup trucks. They followed Clementine’s chain marks into a heavily wooded area, but the chain marks were hidden among other animal tracks. Clementine had been lost for 12 hours, and it was getting cold and dark. The men split into three groups to search, yet, would she let a stranger catch her, or would she just run deeper into the woods? Mules, you see, are funny animals, they do things their own way, so you have to do things their way. A moment later, the other riders came out of the bush. One of them was riding a tri-colored ginny, our Clementine! This wonderful group of strangers came into our lives and to our aid. We could never have found our mule on our own. They will forever have a place in our hearts. What a wonderful story so show the kindness of strangers! Thank you so much for sharing and so glad you were able to find your Clementine.